The month of May 1915 saw the release of many films supervised by Edwin Thanhouser, as well as a few pictures from earlier days. First was the May 2nd offering, Their One Love, featuring the Fairbanks twins. It was during the filming of this picture that bombs exploded and several children were injured. The scribes who were escorted to New Rochelle by Leon J. Rubenstein a couple of weeks earlier viewed this production together with Monsieur Nikola Dupree and the first Falstaff entry, The Actor and the Rube, as showcase models of what Edwin Thanhouser could do. The New Rochelle Pioneer commented that the trade writers' enthusiasm for Their One Love was so intense that this "single reel story is comparable only, in their judgment, to The Birth of a Nation." Note Of course, this was nonsense, but reviews were quite favorable. As a whole: A little gem; Story: Different; Photography: Splendid; Lighting: Remarkable; Camera work: Excellent; Acting: Very good; Exteriors: Good; Interiors: Splendid; Detail: Fine; Direction: Exceptional. In this film we have a story of the Civil War with a different twist, a dainty bit of heart interest, a most commendable effort for perfection of detail, and some wonderful night photography, depicting battle scenes that carry you with them, due to the well-directed action, the proper assembling and the effectiveness of the lighting. Producer Jack Harvey and Cameraman Gregory deserve much credit for this one, and Mr. Thanhouser can be very proud of this release. With the material in hand, after the splendid results secured with the night photography, this film could have been made much longer by padding the story, but had this been done, the strength would have been taken from the film and it would not have been nearly as effective. It is a one-reel "feature." I hope all of the producers make more of them. Not a written explanation mars the film from beginning to end. There are, it is true, several letters to be read, but except for that and a changing calendar to denote the lapse of years nothing extraneous in the picture action halts the self-instructing action. Of course it is rather simple. It presupposes two twin sisters - the Fairbanks twins - who are in love with the same young officer who is called away at the outbreak of the Civil War. Each intends to sacrifice herself that the other may have the man she herself covets. But the news of his death is borne to them and they are shown, white-haired, true to his memory. The war scenes are taken at night and show as pretty and strikingly illuminated scenes of their kind as have yet been done. In connection with well-placed white fire and explosives of every kind, they make some striking silhouette tableaux and views. The film ran a thousand feet. The Last Concert, the first Thanhouser contribution to the Mutual Masterpicture series, ran four reels and was produced during the regime of Charles J. Hite nearly a year before, but for one reason or another it was not released until May 3, 1915. Edwin Thanhouser dusted off this unreleased film because he had not yet prepared a four-reel Mutual Masterpicture. Ellis H. Glickman, who was well known on the vaudeville stage as a Jewish character actor, was hired to direct the picture. At the time of its release in 1915, little attention was paid to it by reviewers. Monsieur Nikola Dupree, produced under the supervision of Edwin Thanhouser, was first screened in theatres on May 4th. 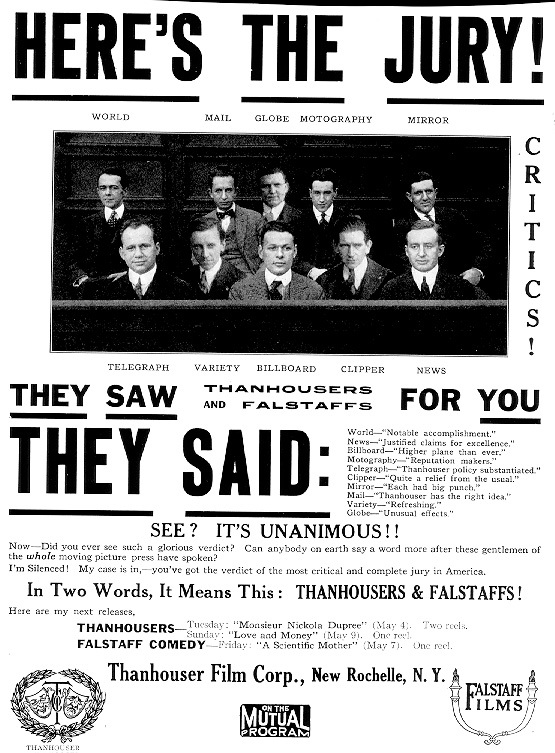 That the president of the studio was trying to create films different from the norm is evidenced by a commentary in The New York Dramatic Mirror: "In accordance with the determination to live up to a consistent grade of films, per se, no cast is given and the story is allowed to unfold on its own merits. That it has what is generally known as a punch, which in this case means a surprise element, is sure...." The Moving Picture World found the film to be an entertaining offering. A Scientific Mother, the Falstaff offering of May 7th, told of a parent who raised her son according to the latest eugenic principles, only to have her boy grow into a giant and eventually wed a tiny girl, all to humorous consequences. Love and Money, released on May 9th, began production on March 1st, the first day of Edwin Thanhouser's new contract. Originally planned as a multiple-reel feature, it was shortened to about 1,000 feet. "The reel is one of about average interest," commented The Moving Picture World, while The New York Dramatic Mirror found the production to be a slight film but "rather well put on." The Song of the Heart, a two-reeler with Arthur Ashley and Mignon Anderson, was distributed on the 11th, followed by the Falstaff film, Ferdie Fink's Flirtations, on the 14th. The alliterative title of this picture initiated the style to be used for most Falstaff releases of the next 12 months. "It seems drawn out," noted The Moving Picture World, while The New York Dramatic Mirror considered it to be "an absurdly silly single-reel comedy," a commentary which may or may not have been favorable. The Three Roses, released on May 16th, was criticized by The Moving Picture World: "This picture might have been more impressive had the costuming been more carefully attended to. It is hard to understand how a Thanhouser production could be allowed to face the public with the attire of the colonial period and that of the present day mingled so promiscuously...." Edwin Thanhouser's honeymoon with the reviewers was over, although it could have been that this was a picture from the pre-March inventory. The Heart of the Princess Marsari, released in two reels on May 18th, featured James Cruze, Marguerite Snow, and Harry Benham in a mystic scenario set in India, somewhat reminiscent of the early episodes of the ill-fated Zudora, and was produced before Edwin Thanhouser's arrival. Reviews were indifferent. God's Witness, released in four reels as a Mutual Masterpicture on May 20th, Note was filmed in Savannah, Georgia, and featured Florence LaBadie and a cast of old favorites. The Moving Picture World considered the picture to be well made and to have a great deal of realism. The next Thanhouser films released on the Mutual program were The Refugee on May 21st, the Falstaff comedy, The House That Jack Moved, also on the 21st, and Daughter of Kings on the 23rd. Fairy Fern Seed, a two-reeler released on the 25th, was directed by Jack Harvey from a scenario written by Gertrude Thanhouser. It's an Ill Wind, the Falstaff film of May 28th, was followed on the 30th by The Angel in the Mask, a one-reel film starring Marguerite Snow and Boyd Marshall.